My friend told me recently, that if I want to draw nice smooth swirly lines in Photoshop or any other 2D Software with my Wacom tablet - I have to use a canvas with high resolution and high DPI. She showed me what happens when I copy such a "large" image into a Photoshop Canvas that is setup to 140 or higher DPI... The Image I created becomes tiny in comparison. She said, it requires at least 140 DP, but the higher the better. Otherwise it will look poodoo as a large print and also will look poodoo when I try drawing hair or other very delicate lines that need to be smooth and flowing. Carrara has the option in the render window, that I can setup a high resolution and DPI. But that somehow didn't do anything and I still can not really draw smooth nice lines to create hair or fur or fine details in Postwork. I tried 1 dot - up to soft 5 - 6 dots. Unfortunately she showed me that stuff on her comp, when I visited her at Montreal. Now I am back to germany - and my Photoshop treats my images as if they are low on DPI. Does that DPI thing even do anything in Carrara? Or do I need an even higher number than 140 or 360 DPI? Any recommendations/suggestions what to do if I want to do a lot postwork by tablet afterwards? I also plan to have some of my works printed in A2 and A3 format - maybe on a Canvas or as a high quality poster. Does that DPI thing even do anything in Carrara? You must set this option to in or cm for DPI to have any meaning. Once you do, the Properties panel will update with the pixel size of your render and an approximation of how large the file size will be. The important thing to remember is DPI means "Dots Per Inch". So when you set "dots per inch", all you are doing specifying the desired physical size. At 200 dots per inch, 2048 dots becomes 10.24 inches. It doesn't change the number of dots you have available, and really won't help what you're trying to do. The solution is that you need to render more dots. For painting hair, you need a LOT more - 4000 is a good start, 6000 works better, I've gone 8000 for fine detail. 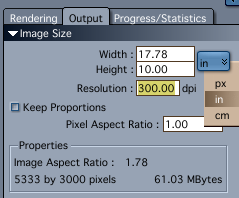 But you set that in the render size setting, not the DPI setting. Thank you Holly and Fenric! so I will do real big renders if I am going to draw finer details. I was always wondering what counts more - the resolution or that dpi thing. The day I got my Wacom tablet was a day of joy and a hissy fit... when I tried drawing hair or details I always got scraggly lines which looked awful. But my Images never had more than about 20/21"
If you have Windows 64 bit system (sorry Apple users) you may be interested in the FREE Autodesk Composition and Matchmover software available at their Website. Matchmoving is the computation of the global 3D geometry of a scene including camera path, internal parameters, and moving object. By exporting the real 3D camera path and parameters to animation software, the position and motion of virtual cameras can be accurately established. With the motion of the virtual cameras, new, matched image sequences can be created whose virtual objects are seamlessly composited into live action footage. Matchmoving lets you accurately place 3D objects into a film, video or image sequence. For virtual objects to appear as part of the scene, the objects have to be rendered by a virtual camera whose motion exactly matches the motion of the actual camera that shot the film. Using Autodesk MatchMover you can generate the exact camera parameters that match the motion of the actual camera used in the sequence. Both are stand alone programs, the Comp program is node based and may make your eyes cross, but is plenty powerful. Yeah, my local printer guy always asks for 300 for posters and such. That software sounds interesting, though not quite what I need... except I misunderstood. I most likely won't draw that detailed but I would be happy if I could do my own hair and fur and clothing details. Alright :) 300 ppi it is for posters. How large are your posters on paper? A1 / A0 ? Kidding. But we don't have that stuff readily available at most stores. I only did posters for promoting my rock bands, and they had some big poster size, like 18 x twenty-something inches. One thing to watch out for when modifying the DPI in an image editing application is whether resampling is on or off when you type in the new DPI. My examples below are from Photoshop, so it may appear different in other applications. 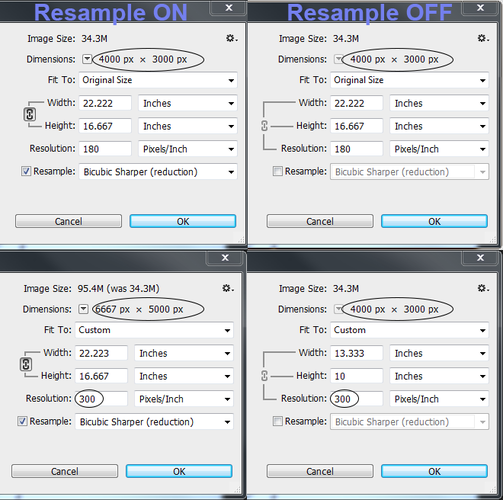 If resample image is ON, and you enter a new DPI (Pixels/Inch), the number of pixels in the image will change, which may not be what you want depending how you are going to use the resulting image. Printing on metal, or 3d printing in metal, or other? Sizes at this link...scroll down for ISO vs US, doesn't include envelopes, they are another whole animal. Drove me nuts when I moved over here for quite some time. 300 is industry standard for any litho printing, or high end digital, even business cards! And if you do posters or anything at all with text in PS, never ever flatten to a tiff, save as pdf so fonts are embedded or they smear into the surrounding image/colour background when printed. That is really nice. Its a very minimalist look without any frame or glass, but very durable.